German cabalist; born at Frankfort-on-the-Main, Dec. 16, 1741; died there Sept. 17, 1800. As a precocious child he won the admiration of Ḥayyim Joseph David Azulai, who, in 1752, came to Frankfort to solicit contributions for the poor of Palestine. 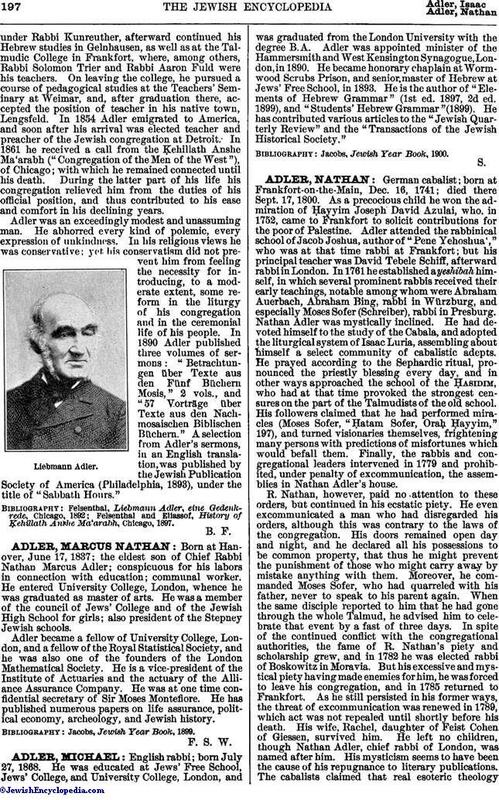 Adler attended the rabbinical school of Jacob Joshua, author of "Pene Yehoshua'," who was at that time rabbi at Frankfort; but his principal teacher was David Tebele Schiff, afterward rabbi in London. In 1761 he established a yeshibah himself, in which several prominent rabbis received their early teachings, notable among whom were Abraham Auerbach, Abraham Bing, rabbi in Würzburg, and especially Moses Sofer (Schreiber), rabbi in Presburg. Nathan Adler was mystically inclined. He had devoted himself to the study of the Cabala, and adopted the liturgical system of Isaac Luria, assembling about himself a select community of cabalistic adepts. He prayed according to the Sephardic ritual, pronounced the priestly blessing every day, and in other ways approached the school of the Ḥasidim, who had at that time provoked the strongest censures on the part of the Talmudists of the old school. His followers claimed that he had performed miracles (Moses Sofer, "Ḥatam Sofer, Oraḥ Ḥayyim," 197), and turned visionaries themselves, frightening many persons with predictions of misfortunes which would befall them. Finally, the rabbis and congregational leaders intervened in 1779 and prohibited, under penalty of excommunication, the assemblies in Nathan Adler's house. R. Nathan, however, paid no attention to these orders, but continued in his ecstatic piety. He even excommunicated a man who had disregarded his orders, although this was contrary to the laws of the congregation. His doors remained open day and night, and he declared all his possessions to be common property, that thus he might prevent the punishment of those who might carry away by mistake anything with them. Moreover, he commanded Moses Sofer, who had quarreled with his father, never to speak to his parent again. When the same disciple reported to him that he had gone through the whole Talmud, he advised him to celebrate that event by a fast of three days. In spite of the continued conflict with the congregational authorities, the fame of R. Nathan's piety and scholarship grew, and in 1782 he was elected rabbi of Boskowitz in Moravia. But his excessive and mystical piety having made enemies for him, he was forced to leave his congregation, and in 1785 returned to Frankfort. As he still persisted in his former ways, the threat of excommunication was renewed in 1789, which act was not repealed until shortly before his death. His wife, Rachel, daughter of Feist Cohen of Giessen, survived him. 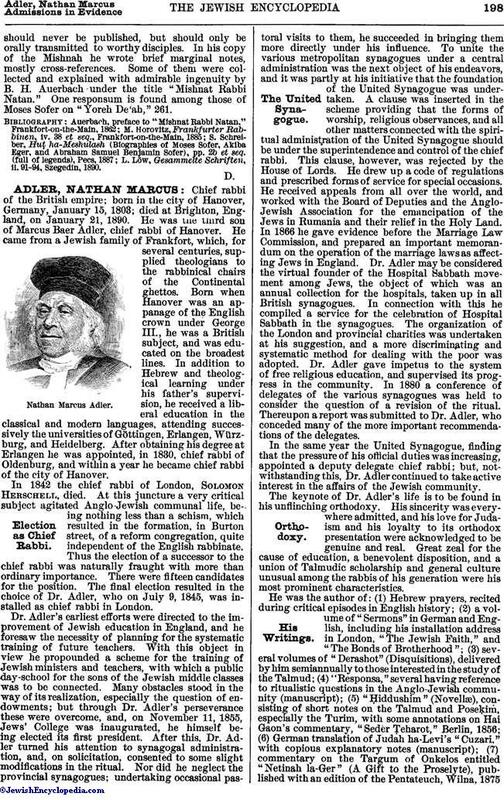 He left no children, though Nathan Adler, chief rabbi of London, was named after him. His mysticism seems to have been the cause of his repugnance to literary publications. The cabalists claimed that real esoteric theologyshould never be published, but should only be orally transmitted to worthy disciples. In his copy of the Mishnah he wrote brief marginal notes, mostly cross-references. Some of them were collected and explained with admirable ingenuity by B. H. Auerbach under the title "Mishnat Rabbi Natan." One responsum is found among those of Moses Sofer on "Yoreh De'ah," 261. L. Löw, Gesammelte Schriften, ii. 91-94, Szegedin, 1890.